Like a veteran athlete coming out of retirement to help the team, Chair 5 will be back in the lineup next season. Once a key player for the mountain, Chair 5 will be reassigned to a new position on our mountain’s chairlift squad—it’s moving from Ptarmigan Bowl to the East Rim adding more dimension to this exceptional team. In its rookie year, 1981, Chair 5 was a top draft pick out of CTEC (Cable Transportation Engineering Corporation), the hottest chairlift manufacturer at the time. Nicknamed the “High Five” lift, the chair gave skiers another way to get to the summit, as well as a way to keep skiing without going all the way to the base area. Chair 5 was a star player for several seasons, especially when lower mountain skiing was just meh. 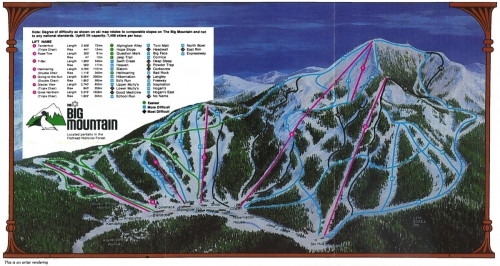 In 1985, another rookie, Chair 7, shared the limelight with Chair 5 as it added North Slope skiing and unloaded steps away from the new Summit House. However the game changed in 1989 when a new player came to town to replace the retiring Chair 1, and sent Chair 5 to the bench. The ski area’s new star (the new Chair 1), a high-speed quad, cut the ride time of the original Chair 1 in half, thus making the “Chair 4 to Chair 5” trek less inviting. The 1990s were tough on Chair 5, playing less and less of a role on the team. Then in 1997 with the addition of 550 acres in Hellroaring Basin, the addition of Chair 8 and upgrade of Chair 7to a high-speed quad, Chair 5 found itself riding the bench most of the time. In the last two seasons, it has not seen a single play. Next year the game changes again as Chair 5 will be in play daily adding a pod of skiing on the east side of the resort. With a bottom terminal located at the intersection of Moe-Mentum and Russ’s Street, skiers from the North Bowl and as far as Flower Point via One Grand Parade and everything in between including the cliffs and chutes of East Rim, Moose and Evan’s Heaven and Lee’s Way can ride Chair 5 up instead of taking Russ’s Street. Once at the top they can head to Chair 7, Flower Point or T-Bar 2. Although it may not sit as high as it once did, there will be high-fives for the reincarnated East Rim lift.